I think it's time for me to see a really really old Bette Davis movie. Perhaps one where she's not made up to look like a psychopath or acting the part of a psychopath. Because as good as she is at being a psychopath (and I really think she's one of the best), I think she may have done other work. Or has she? Anyways, I did have to see this movie. It's well-known, and I hadn't seen it yet. And I did enjoy it. 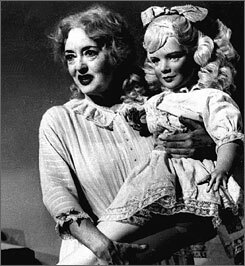 It just makes me wonder what else Bette Davis can do. This film is as creepy as the Baby Jane doll in the above photo. For an even creepier photo, search for color shots of Bette Davis's make-up on the internet. Davis plays an aging child star stuck caring for her crippled former grown-up star sister (Joan Crawford). 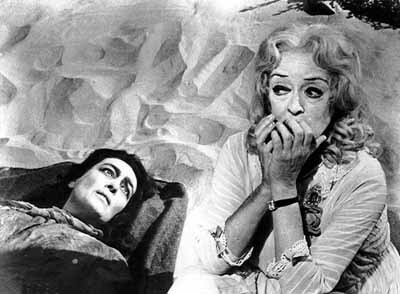 While Joan Crawford's character is entirely dependent on Baby Jane, she is also more than a little afraid of her and is working hard on a plan to sell the house and move, sending the wacky Baby Jane to a place where she can be cared for. Unfortunately, Baby Jane is not as dumb as she is insane. When she figures out what her sister is trying to do, she doesn't approve. And people start dying. Three stars, and I would see it again, mostly to help others experience it. This movie is so wonderfully hideous. Bette Davis goes all out and she is just fabulous. Favourite scene? Bette trying to re-enact her show 'ive written a letter to Daddy.' So disgustingly awesome. Thanks for the recommendations. Just watched Now, Voyager a little while ago, and I'll have to look for the other two.